February 12, 2017 • CATEGORIES: Advertising & Brochures, Features • TAGS: Hubs, patents, Popular-Science. UPDATE III: Thanks to Steve, we’ve discovered an additional version. It is now number 5, which seems to be an evolutionary step between 4 & 6. 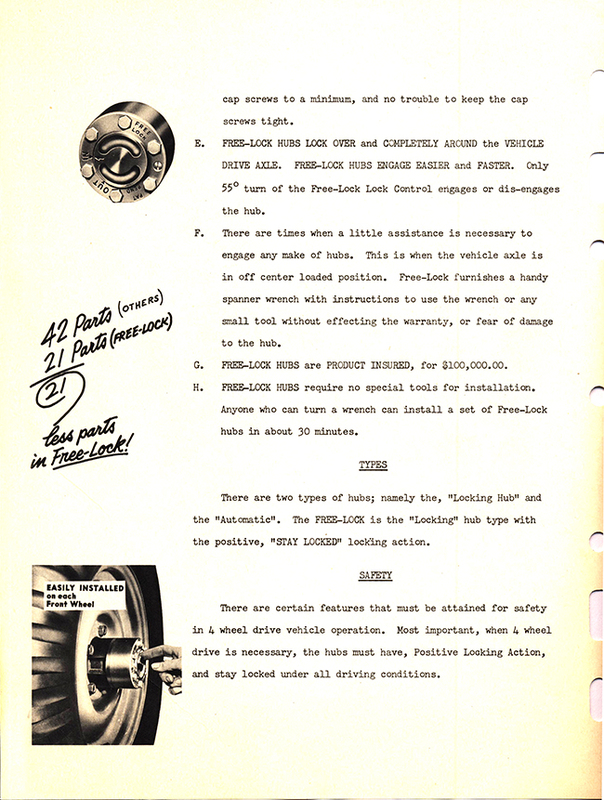 UPDATE II: Thanks to Frank Day and his grandfather Merton, who saved this rare piece, here is a scan of an eight page brochure related to the Free-Lock corporation. 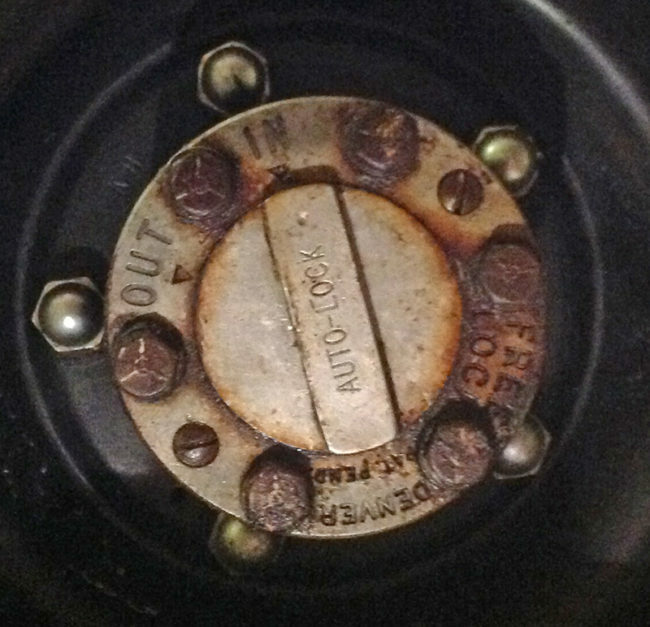 UPDATE: Thanks to Rob, we now have an “in-the-wild” photo of the slotted Free-Lock hub. 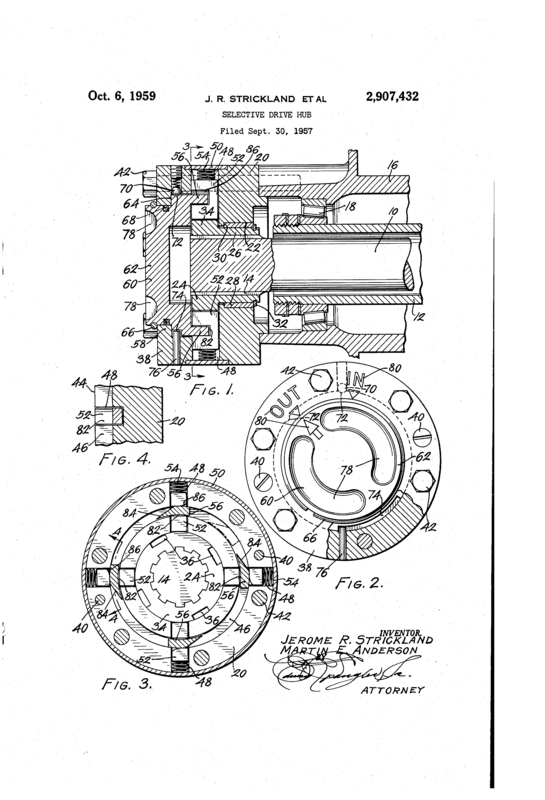 I’ve also updated the post to indicate there were four slightly different designs and an additional patent that we’ve documented. 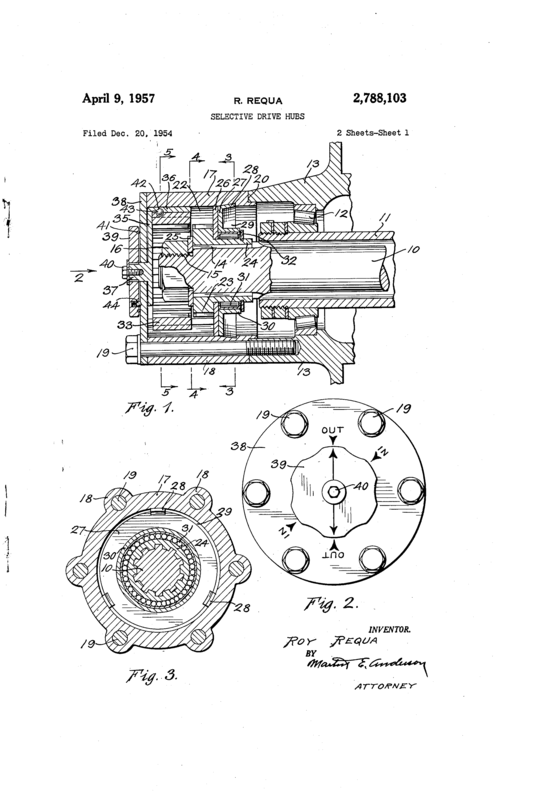 In 1952, Aurthur Warn filed a patent for an adjustable clutch front hub that would allow jeep owners to engage and disengage their front axles in and out of four wheel drive. 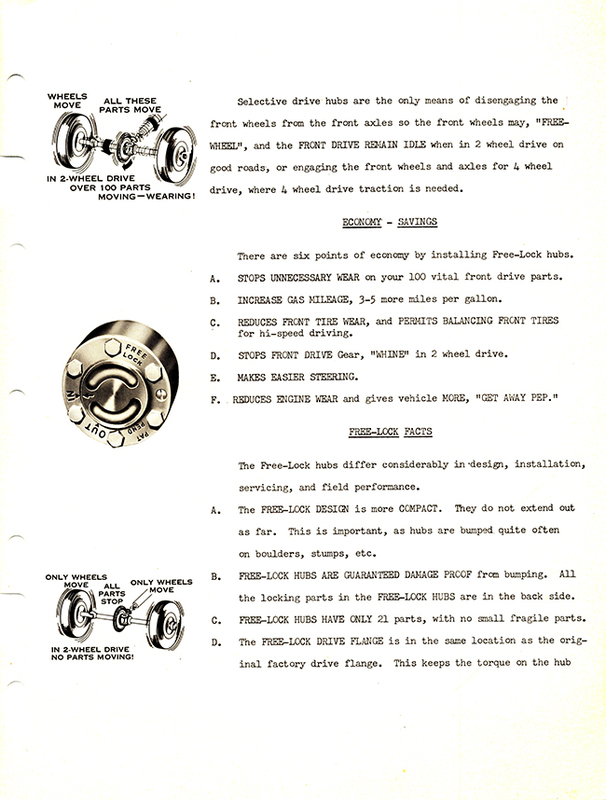 Warn was awarded a patent for his work in July of 1954. 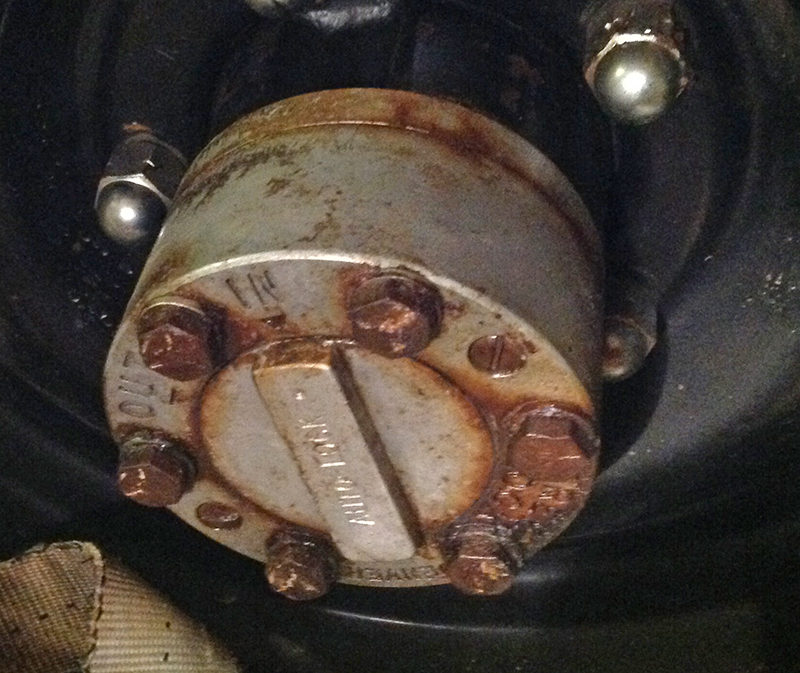 The problem with these Warn hubs was that the clutch design was complex. 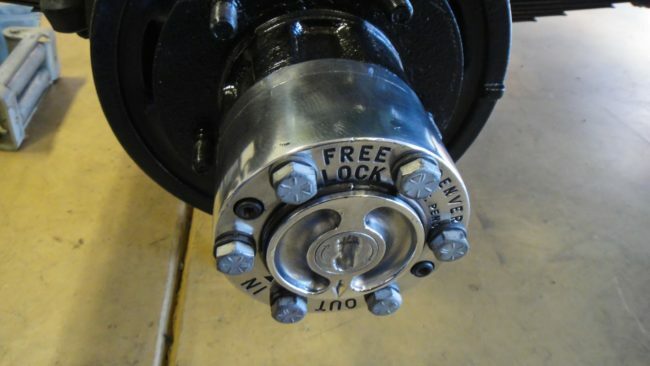 With this in mind, a company called the Free-Lock Corporation developed an alternative hub. In December of 1954, only six months after Warn patented his hub, Roy Requa submitted his design to the patent office. We have yet to document this exact design on a jeep. 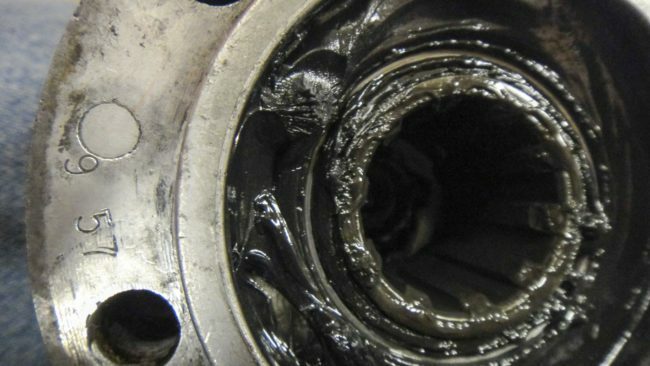 The reason for this might be because the face of the final hub may look different than the design shown in the patent. Perhaps Free-Lock found that in practice users needed a tool to switch the hubs in and out. 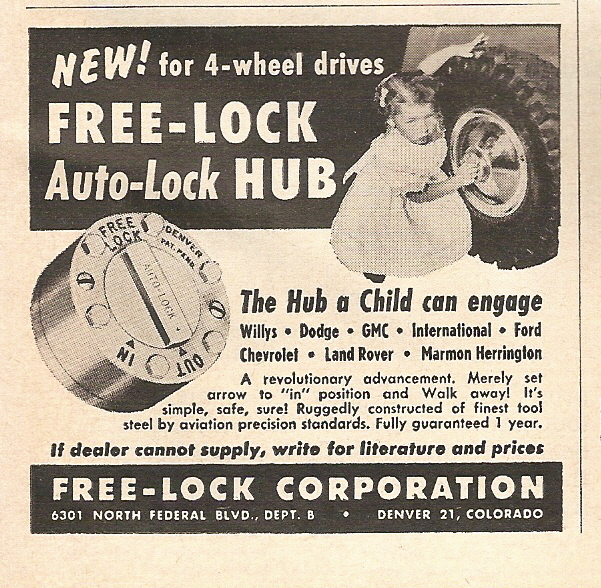 However it happened, soon the first Free-Lock hub was born. It probably began selling in 1955. 1. 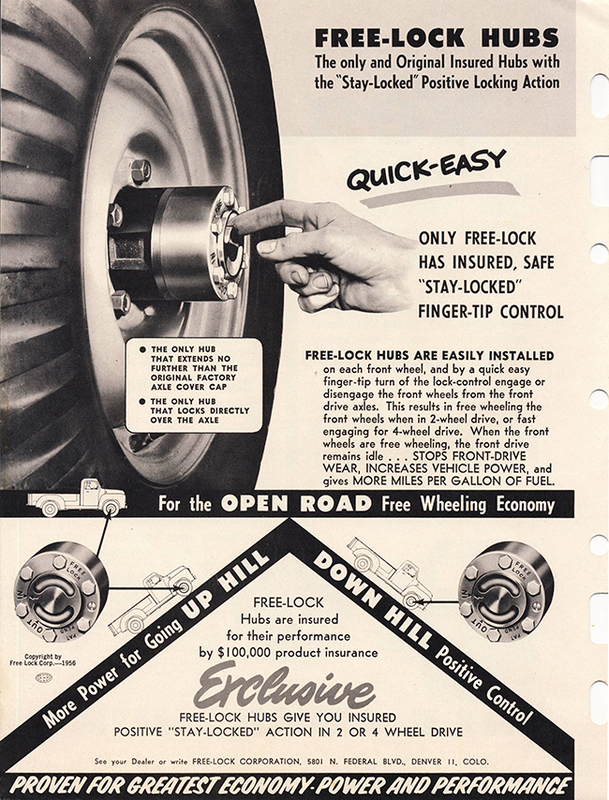 The 1-screw Free-Lock Hub: By October of 1956, the Free-Lock Corporation had created the large brochure above and a smaller one (yet to be published). 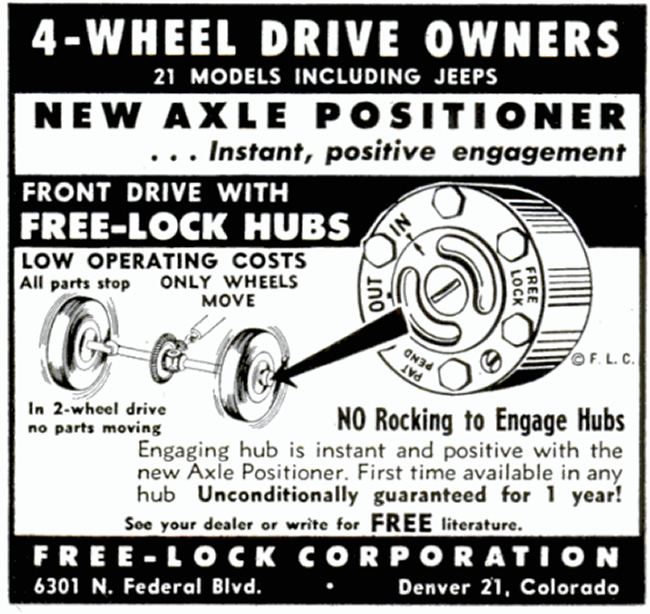 The company also took out ads for the hub in Popular Mechanics (and possibly Popular Science, in which they did publish later). 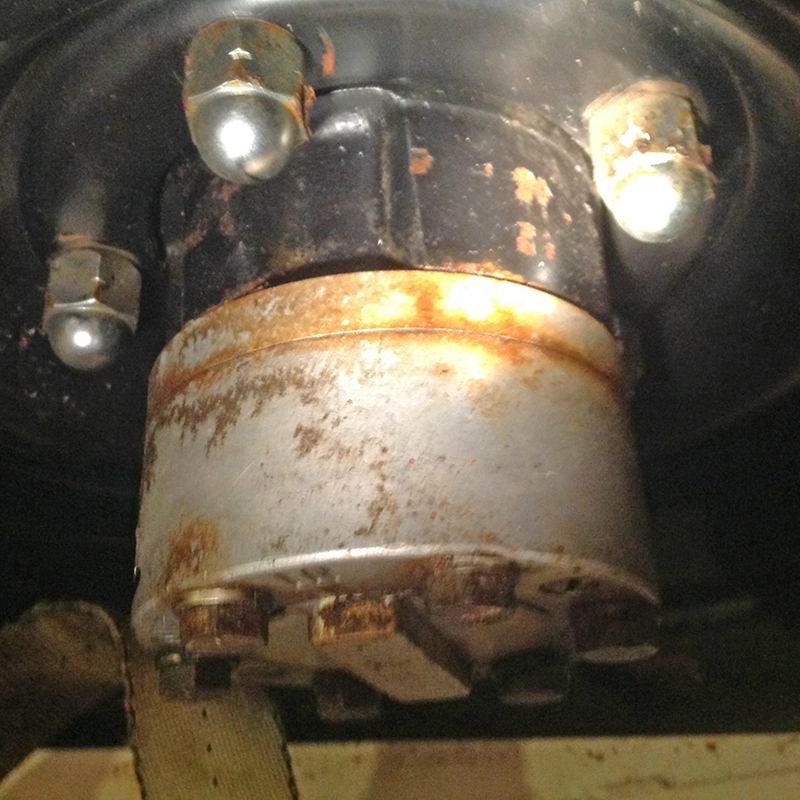 In the case of this hub, there is only one screw along the outer radius. 2. 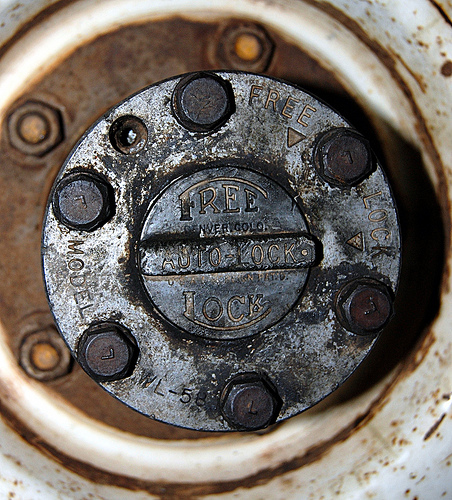 The 2-screw Free-Lock hub: At some point, the company changed the design slightly, adding two screws and shifting the stamping. 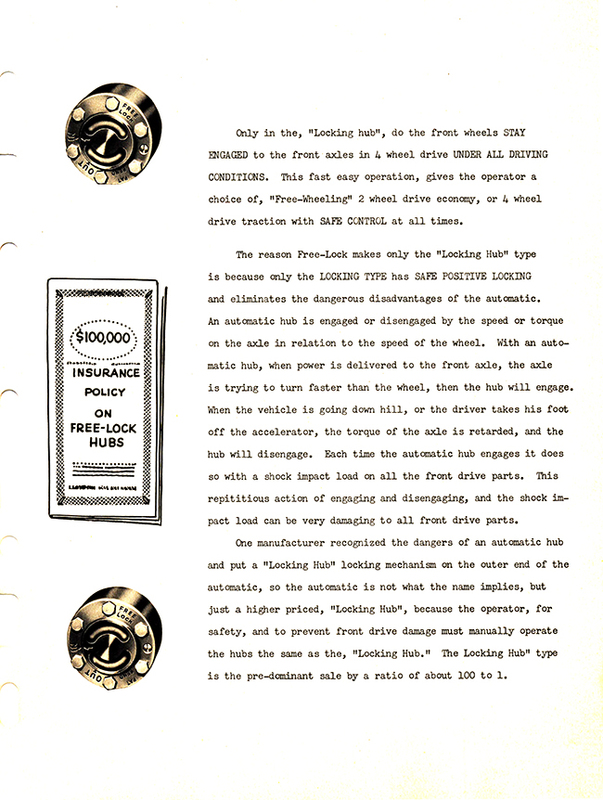 This became part of a co-pending application between James R. Lloyd, Sr., and Francois A. Heck, but filed by Martin E. Anderson and Jerome R. Strickland. Here’s an example of that hub, along with the tool used to turn the hub. More photos can be seen at the G503 site. There are also photos of it disassembled there. 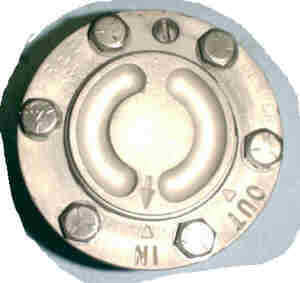 Note that neither the hub above or below has a center screw. 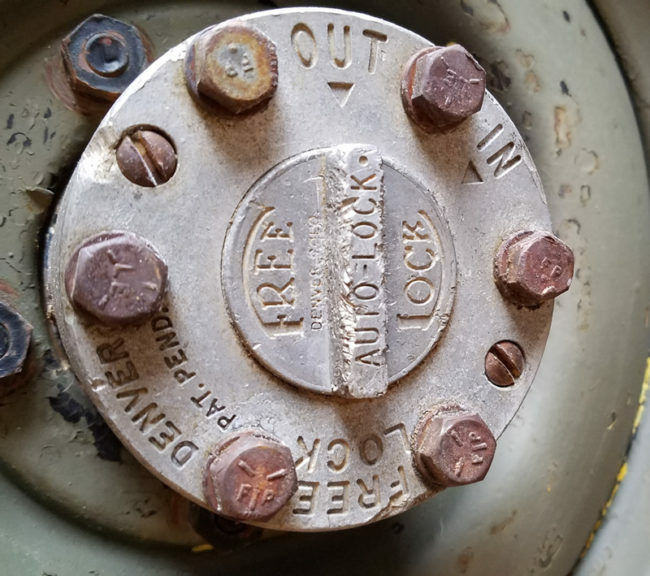 Rob tells me that the center screw spins on his hubs, but doesn’t seem to do anything. And, he’s never disassembled one far enough to determine what it does. He’s just happy that the hubs work fine independently of the mysterious center piece. 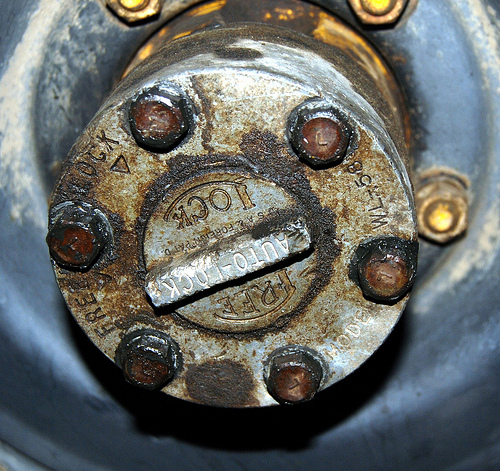 A G-503 thread comment noted that a set of Free-Lock hubs had WL-57 on them. 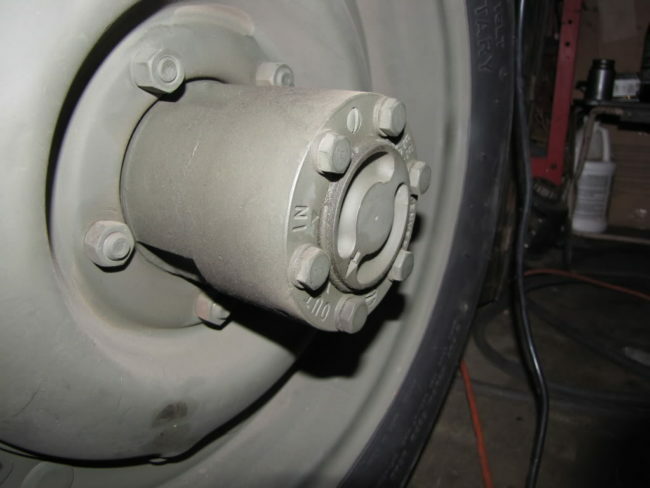 However, no pics were provided to show which type of hubs those were. 4. 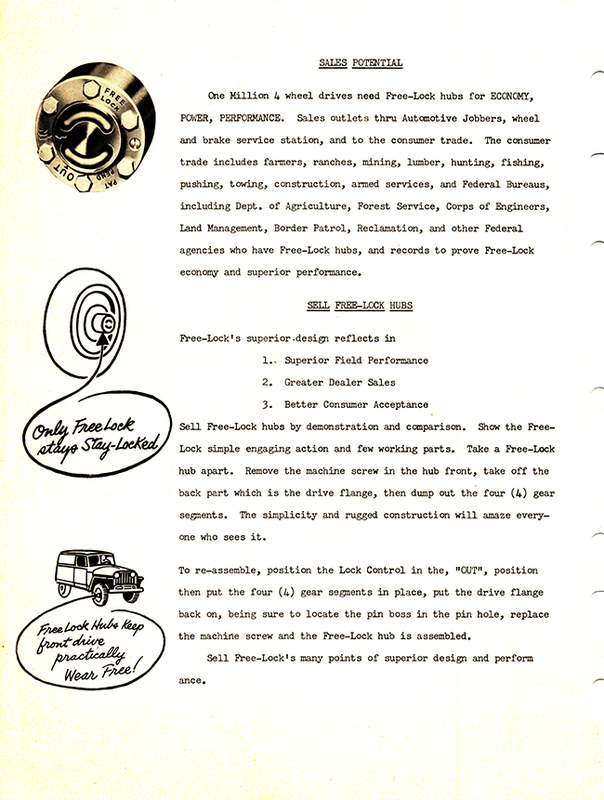 Free-Lock Auto-Lock 2-screw hubs non-cursive writing on tab: Around 1958, the Free-lock Corporation developed a new type of hub. 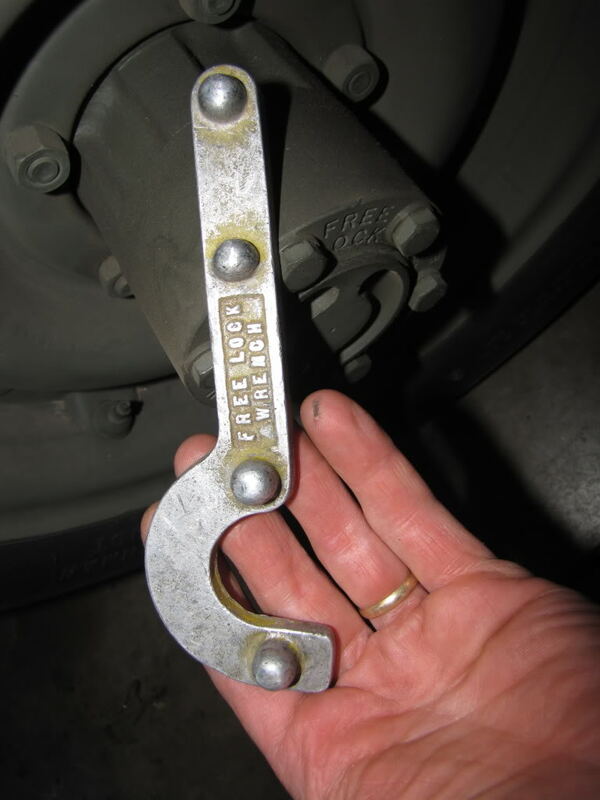 It no longer required the use of the tool and was so simple even a child could use them (or so the company claimed — do we need kids messing with our hubs!). 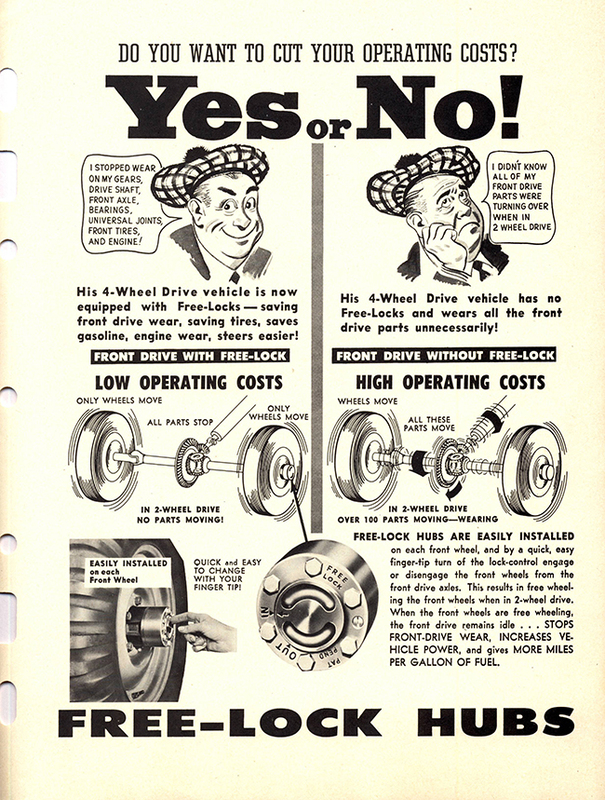 The ad can be found in the July 1958 issue of Popular Science or the December 1958 issue of Popular Mechanics. 5. Free-Lock Auto-Lock with two screws and OUT/IN with with arrows, but cursive writing on the tab. This is Steve’s hub. What happened to the Free Lock Corporation? I don’t know. What I do know is that the last ad I could find was published in the January 1959 issue of Popular Science. 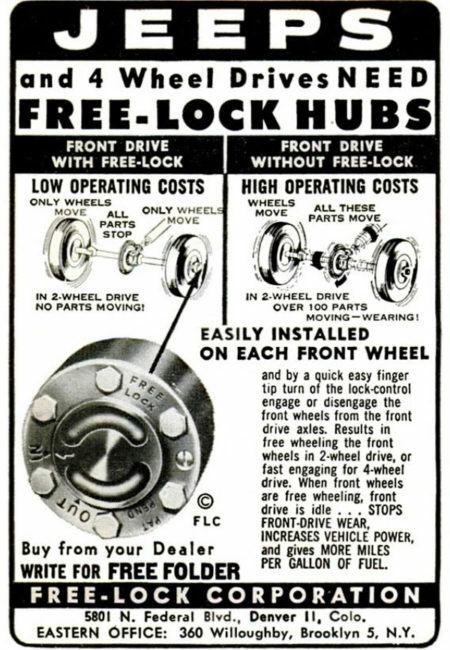 Interesting how I had never heard of the Free-Lock Hub till I heard it mentioned here. 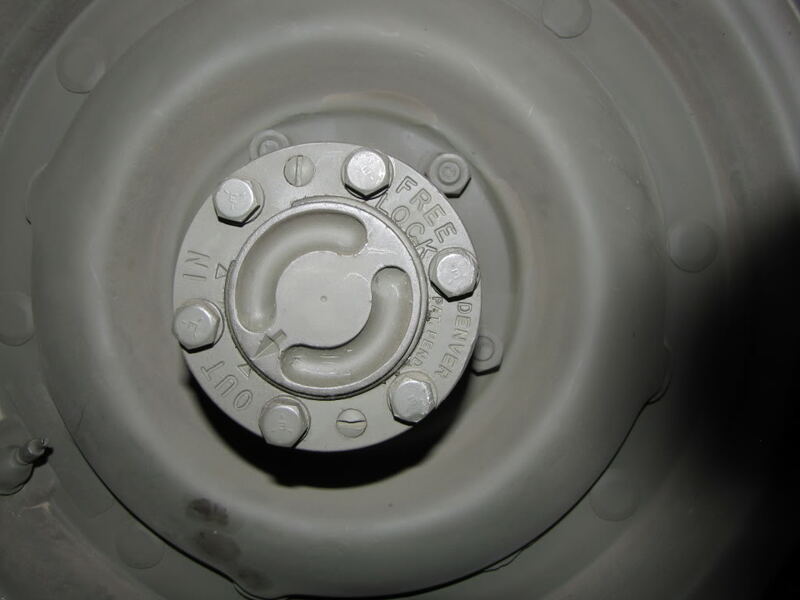 Warn hub was always the preferred hub and I think the reason was NAME RECOGNITION. 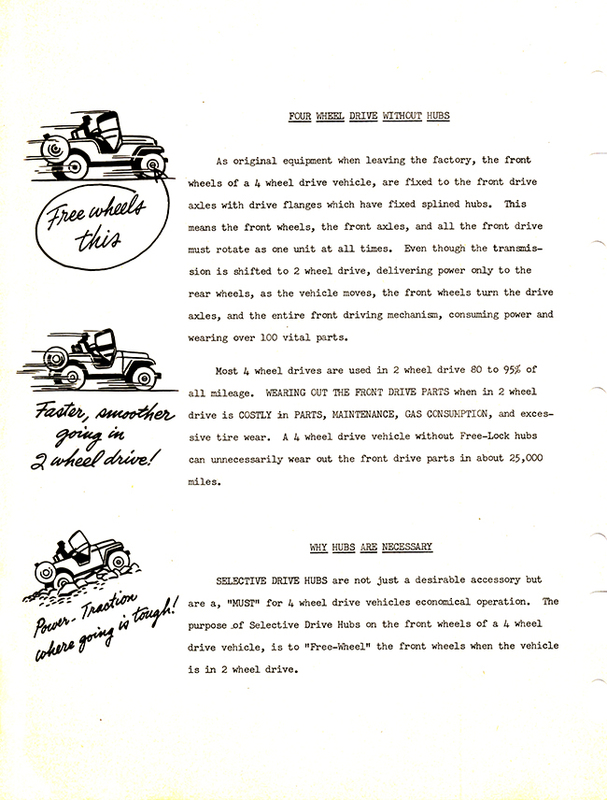 Early on, Warn became JEEP APPROVED EQUIPMENT and hence it’s control of the market. That’s a good point. 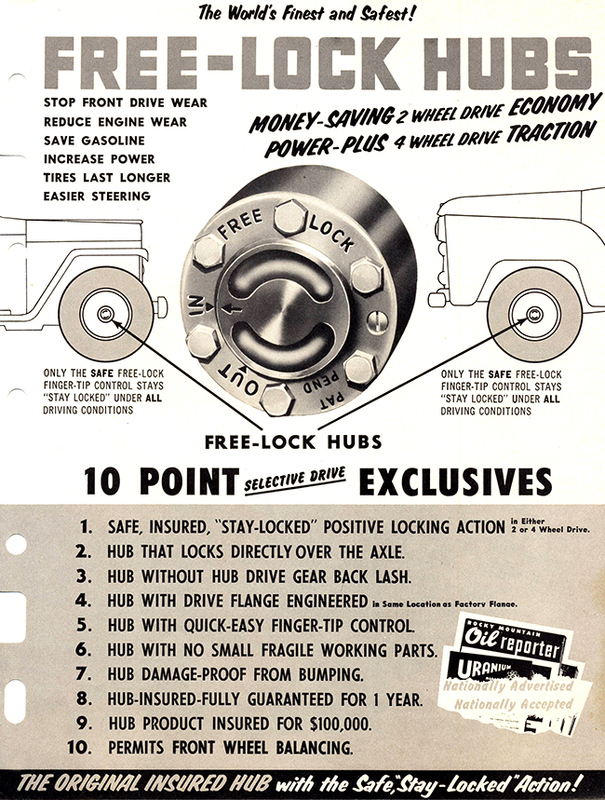 I have yet to see Free-Lock hubs mentioned in any Jeep Approved books. 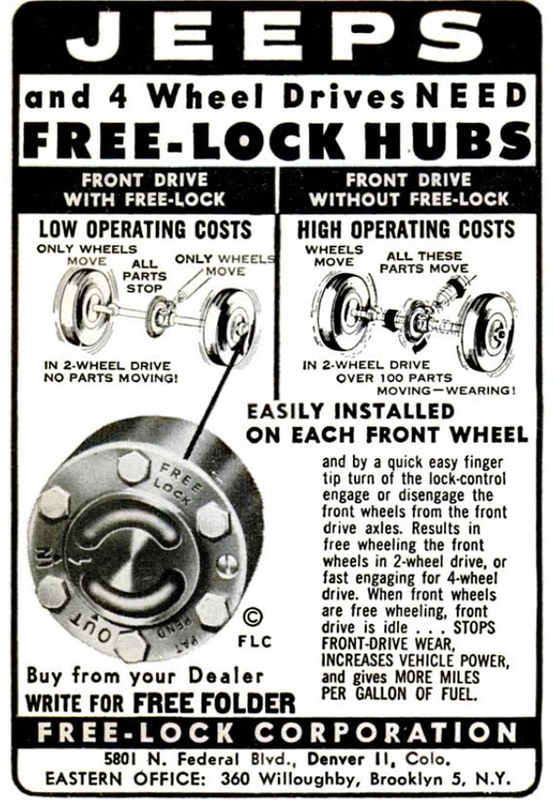 For what it is worth, by 1959 Warn was claiming in one ad that they had sold over 100,000 hubs. That is conceivable given that there has been approx 1.5 million jeeps built by that time, let alone some of the other 4WD vehicles that began to appear. (Of course, many WWII jeeps never returned and many folks weren’t interested in aftermarket hubs, so I’m not sure what the true market for hubs was, but, to your point, Warn had a significant amount of the market). If you get a chance to take some good pictures of it, I’d love to get them. I could used a coupe high resolution photos of that later hub. Just email them to d@ewillys.com. Thanks! I’ll have to get my 15 year old daughter to help me. They are on a 1946 willys, my father built in the 60s.